Falls Creek has been unanimously nominated by myself as "2004's new creek with the most potential (if it weren't so screwed up with wood)" Hopefully the notorious summer floods will clean some of the wood out of this one as it is a another Northwest steep creek classic just waiting to happen.. 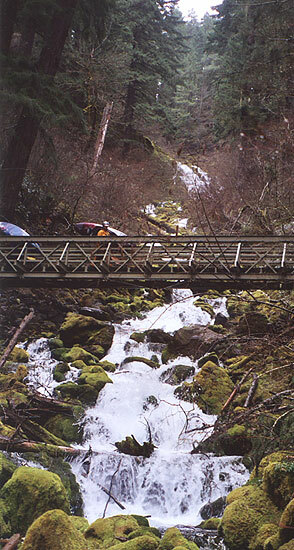 Question for you...have you heard of anyone running Falls Creek in the Wind River drainage? The put-in is at the base of the several hundred foot Falls Creek Falls and you run down through a narrow gorge taking out just downstream of a footbridge that crosses the creek. Big slides at the put-in, lots of technical boulder gardens and ledges, lots of log jam portages mixed in with interactive wood features :-), and a couple of very fun gorges. Chuck Taylor, Luke Spencer, Bill Jankovich, Tony Crawford, Ryan Scott, and myself ran it on Sunday. OPB was there to do a documentary on exploratory boating...they filmed a lot of it and gave us a fancy camera to take into the places they couldn't get into. I will tell you one thing about Falls Creek...I'm super sore today. That being said...I think it might be your type of creek. There are some quality sections, but a lot of portaging around wood. Aside from the mandatory wood portages, we were able to run everything minus one very short, super chunk drop that just didn't look any fun. There is one ten foot ledge drop at the end of a technical boulder garden that has a cave behind it...but a GOOD cave :-) It's about 15-20 ft deep cave and you can paddle behind the curtain and hang out in the room. Very cool! I wouldn't want to have any less water in it than what we had yesterday...it would get too pinny. The slides at the put in are amazing...incredibly fun. More water would make this run exceedingly dangerous only due to the last chance eddies above hazards getting too small to accommodate a boater...many were only one boat eddies at yesterdays flow. Pete Giordano and I had been wondering about Falls Creek for a few years before Pete got the news that Bryan and the rest of Team PBR had run it. In early 2003 Pete and I tried to drive up the road that accesses Falls Creek but were stopped by a gate. Later that year after some map work and speculation our friend Marc Strabic hiked up along the lower gorge and reported some class III-IV stuff, very scenic but not too challenging. He said there was a lot of wood above the lower gorge, so we lost interest. 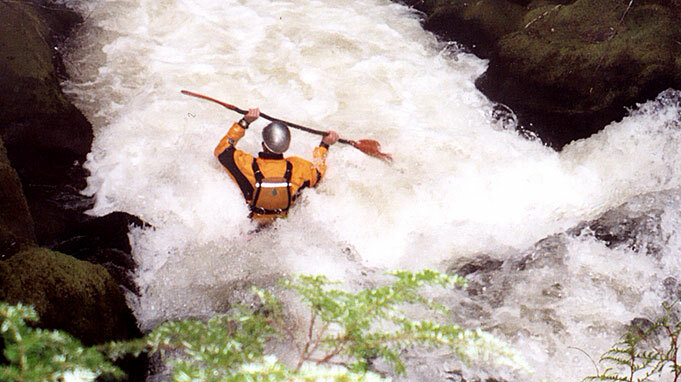 Then we got the email from Brian, and we immediately made plans to paddle the creek the following weekend. I forwarded the message on to Gabe Flock and Jesse Coombs, (both of whom love exploring new creeks) and they joined up immediately. Brian his crew had about 460 cfs in the East Fork at Heisson gauge after a week or so without rain, which means this creek does derive some of it's water from snowmelt. We ran the creek a week later after a couple of days of rain and warm weather, and the EF at Heisson was reading 1,400 cfs. We were a little concerned about having too much water but decided that we would drive up and give it a look and see if the run seemed reasonable. On Saturday we converged on Falls Creek road, and luckily for us the gate was open. We quickly drove up to the trailhead headed up the path, deciding in advance to scout the lower part of the creek to ensure it didn't have too much water. Once we arrived at the footbridge we looked for the undercut against the left wall, which was visible. ( Bryan had advised earlier that if the undercut under the river-left side of the footbridge was filled in, not to run the creek ). The flows looked good, so we saddled up for the hike in. The hike wasn't too hard, and after studying a few logs in the lead-in section to the gorge we headed upstream. The gorge was certainly class III-IV as described by Marc, but the section upstream was anything but, with very high gradient and non-stop rapids. The 500-foot falls at the put-in was breathtaking; no description can do this drop justice. Here the creek roars over three tiers (the bottom two tiers are shown in the photo on the right) and then down through an enormous series of class V boulder gardens and slides. All of us just stood there gaping in awe when we arrived at the falls, but only Jesse looked at the falls itself or the slides below with any thought of kayaking them. Jesse Coombs and Pete Giordano cross a trib on the hike in.. The sheer scale of the place required about ten minutes of contemplation by everyone in our group, and we all just sat and looked, at least at first. Soon it became apparent that Jesse was thinking of running the huge drop below the slides, so we trooped off down into the canyon to check out the particulars of the drop. The drops below the main falls are definitely a series of individual drops at lower flows, but at this flow all of the distinct slides and boulder gardens blended into a single roaring, frothing, monster drop. I divided this rapid into five distinct sections, each of which required safety and careful scouting, with much active speculation about lines, safety, and the kind of nerve it takes to contemplate tackling such a massive rapid.. only Coombs had summoned up the nerve on this particular day. The 'Warm Up' rapid on Falls Creek, broken down..
Part one: From the base of the falls, several very tough moves past sieves and siphons contained in a large boulder garden, which feeds directly into..
Part two: A burly 25 foot tall slide-falls which features a huge, folding hydraulic halfway down that almost guarantees a flip; this falls plunges into a beefy hole at the bottom which flushes into a boulder sieve on the left with a narrow outlet in the middle, which leads to..
Part three: A 17 foot tall slide-falls that flushes directly into..
Part four: A 12 foot tall waterfall with a large, boiling pool at the base which empties into..
Part five: A trashy, technical boulder garden that ends with the creek plunging under a logjam. There is a tiny one-boat eddy a few feet to the right of where the creek plunges under the logs, though, and this is the eddy Jesse was planning to hit..
Jesse Coombs and Gabe Flock ponder the huge "Warm Up" rapid on Falls Creek. Of our group, only Jesse ran this drop from top to bottom.. pretty incredible stuff. Finally we were all in position, with three ropes spread throughout the rapid nearest to the hydraulics and above the worst hazards, and Jesse got ready. He put in at the base of the huge falls, and the exit moves from this pool involved several very tough moves just to get to the biggest vertical falls, and then it was off to the races. Jesse came screaming out of the top boulder garden without problems, then dropped over the first 25 footer, disappearing into the huge folding hydraulic halfway down, emerging upside-down, then he was back upright, dropping over the second falls, as shown below..
Jesse comes ripping down 'part three' of the five-part class V+ warm-up rapid on Falls Creek. 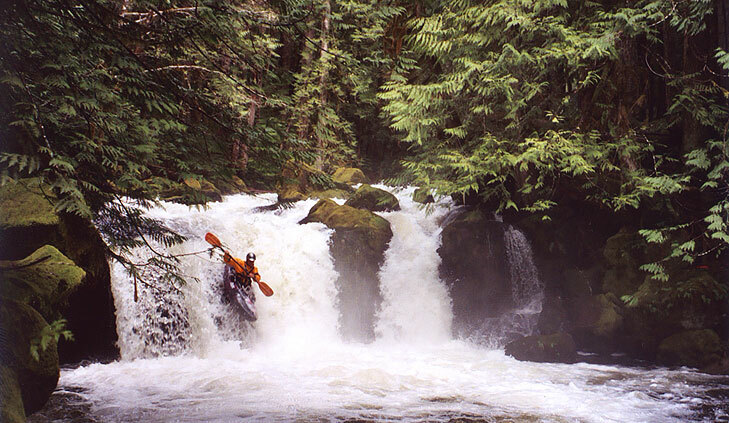 'Part 2' of the slide is visible upstream and is class V by itself; 'Part 1' is not visible upstream and also requires some very tough moves to make it to 'Part 2' seen in the background..
Jesse ripped down the last part of the falls below me and managed to catch the micro-eddy right next to the logjam downstream. 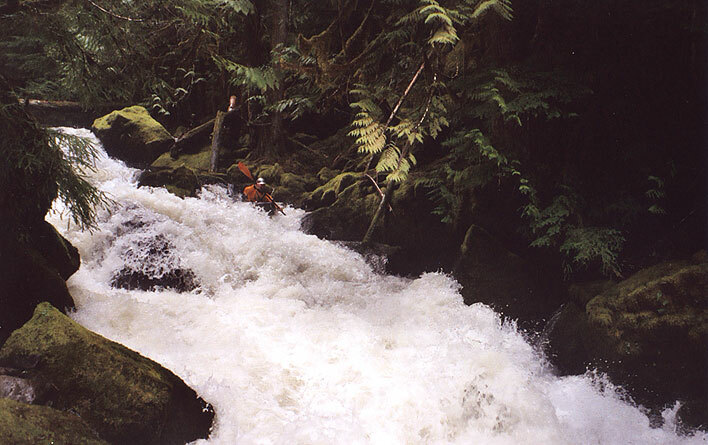 Man, that was some of the most impressive paddling I have ever seen..
Jesse drops into 'Part 5', the twisty and technical boulder garden leading into (and under) the logjam just out of sight. 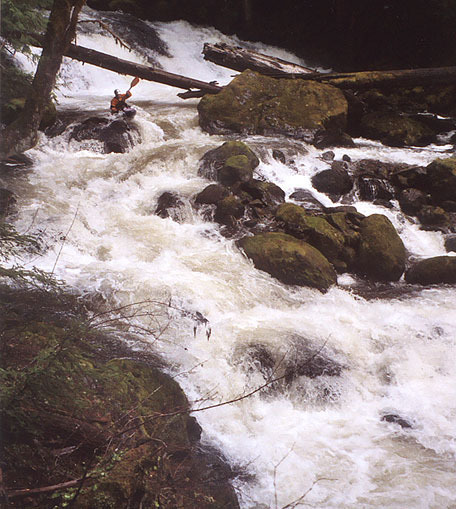 'Part 4', the final 12-foot falls, is visible upstream. Below the warm up rapid were some more boulder gardens, then a very steep boulder garden leading to another waterfall, shown below..
Jesse drops over the middle falls, about halfway down the crux section of Falls Creek. Immediately below the middle falls is a very steep, beefy drop that the PBR crew portaged because they didn't have enough water to run it cleanly. At these flows it was definitely more do-able, but Pete and I still didn't like the looks of it so we walked. 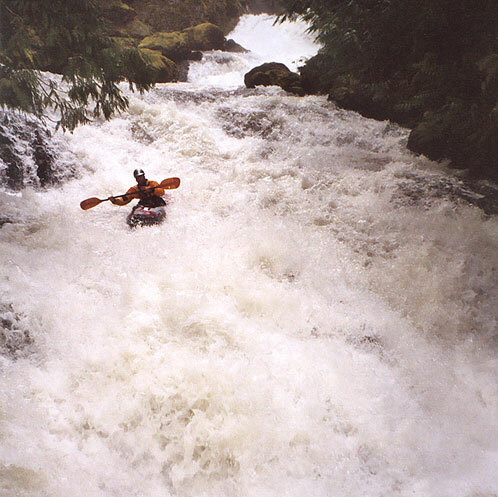 Of course, Jesse fired it off with no problems, making the first known kayak descent of this rapid, dubbed 'SuperChunk' by Team PBR..
Jesse probes 'SuperChunk', the beefy, boulder-choked rapid immediately downstream of the middle falls. Below SuperChunk were more smaller drops then we began the portage-fest of logjams, we probably portaged about six or seven times between here and the lower class III-IV gorge. I bailed out there but Pete and Jesse continued downstream, reporting even more logs and portaging below the gorge..
Jesse runs a typical ledge in the final class III-IV gorge on Falls Creek. There were about 5 or 6 drops this size or bigger in this gorge. Falls Creek flows into the Upper Upper Wind River high above the regular Upper Wind section, coming into the class III 'Upper-Upper Wind' section as described in the Bennett guide. We had a pretty significant rain-on-snow event in the spring that set this run off, and our flows were pretty decent though you could definitely go higher. We had about 1,400 cfs in the EF Lewis at Heisson, but we think this gauge only provides a slight correlation. Falls Creek seems to have a strong spring-fed component, so it will probably always have disproportionately more water than the other small creeks in the area. The run is a little over a mile long, and requires a hike in along a trail that borders the lower half of the run; the gradient on this section is somewhere in the 300 fpm range, and gets steeper the higher you go.